Runtime Error 429 is a Visual Basic error. Users get it while trying to create instances in programs which use Visual Basic (eg. MS Office). User face this error when the Component Object Model (COM) cannot create the requested Automationobject, and thus Visual Basic does not receive the automation object. An SFC scan could help find problems with sectors in the hard drive and resolve them, something which could be very helpful for this issue. It would need some time to clean up the system using the command line. 1] Navigate to the path of the application in File Explorer. It is usually inside C:/Program Files, where C: is the system drive. 2] Copy the location. Eg. 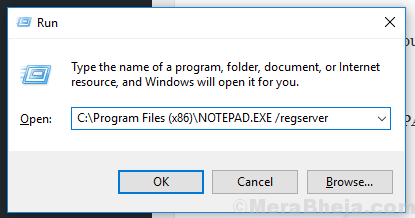 The location for Notepad would be C:\Program Files (x86)\NOTEPAD.EXE. An incorrectly installed or corrupt Microsoft Windows Script could be the reason for the Runtime Error 429. You could download and install it again from its website. Restart the system once done. Over and above everything, we could try updating Windows, something which is equally good as a prevention. Here is the procedure to update Windows.